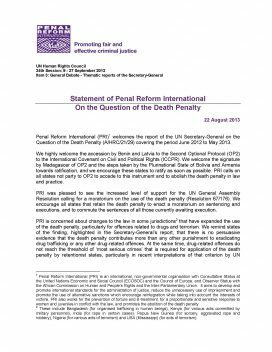 It welcomes the report of the UN Secretary-General on the Question of the Death Penalty (A/HRC/21/29) covering the period June 2012 to May 2013 and details areas of concerns. These include in particular changes to the law in some countries that have expanded the use of the death penalty, particularly for offences related to drugs and terrorism. The statement notes, for example, that drug-related offences do not reach the threshold of ‘most serious crimes’ that is required for application of the death penalty by retentionist states, particularly in recent interpretations by UN experts. Finally, PRI welcomes the Secretary-General’s reference to the issue of children of parents sentenced to death and the panel discussion at this session of the Human Rights Council dedicated to the rights of these children (which will be held on 11 September 2013). See also PRI’s statement to the Human Rights Council on the Human Rights Impact of the over use of imprisonment. Statement to the 21st session of the UN Human Rights Council, 4 September 2012.